You say chicken and I would say a YES! That’s my love for the Chicken cuisines. So, here I’m, again, with another Recipe – Kashmiri Chicken Rogan Josh. Usually, people have mutton rogan josh but as I said I love chicken cuisines, I replaced mutton with chicken and made this Kashmiri Chicken Rogan Josh. If you are wondering why Rogan Josh. Yes, Josh means passion and Rogan means clarified butter or dish cooked in red gravy. And since it’s a Kashmiri Cuisine, hence the name – Kashmiri Chicken Rogan Josh. I have tried my best to give you an authentic recipe for Rogan Josh. This dish is red in colour as it contains kashmiri red chilli powder and saffron. I made this dish for the kiddos at home 😉 — my daughter and my husband as they both are picky eaters. I know I’d said this many times in my previous posts 😛 . But as soon as I served them Chicken Rogan Josh, they finished and, in bonus, I got lots of appreciation specially from my daughter “… wah! Mom tasty, Yummy, super duper delicious”. For me, if food looks good and attractive too, it will, automatically, increase your apetite. What do you say? I know many of you will back me on this 😀 Isn’t it? This recipe of kashmiri chicken rogan josh gives mild taste of chilli as it contains kashmiri chilli powder which is not too hot. This dish contains saffron, fennel powder, asafoetida (hing) and ginger garlic. So, let’s start with our recipe. Heat the mustard oil in a pressure cooker or a deep cooking pan. While heating, cover the lid for 2-3 minutes on high flame to make it smoky. The bitterness of the mustard oil will also be removed. Now take off the lid and turn off the gas so that the oil cools down slightly. After 30 seconds, put on the gas again and add finely sliced onion to fry them till brown. Once the onions are fried, keep them aside. Now in the same pressure cooker fry the washed chicken pieces for 5 minutes. After frying chicken, add fried onions and asafoetida (hing) and cook further for 5 minutes. Add some water if needed. Let’s blanch the tomatoes while the chicken is getting cooked. To blanch the tomatoes, boil 2 cups of water in a small pan. Add tomatoes for only 5 minutes. Then take them out and peel the skin. Now grind them. Now add this tomato paste to the chicken curry, in the pressure cooker, and cook it on the low flame. Add kashmiri chilli powder, salt, saffron (kesar), fennel (saunf) powder to it and mix well. 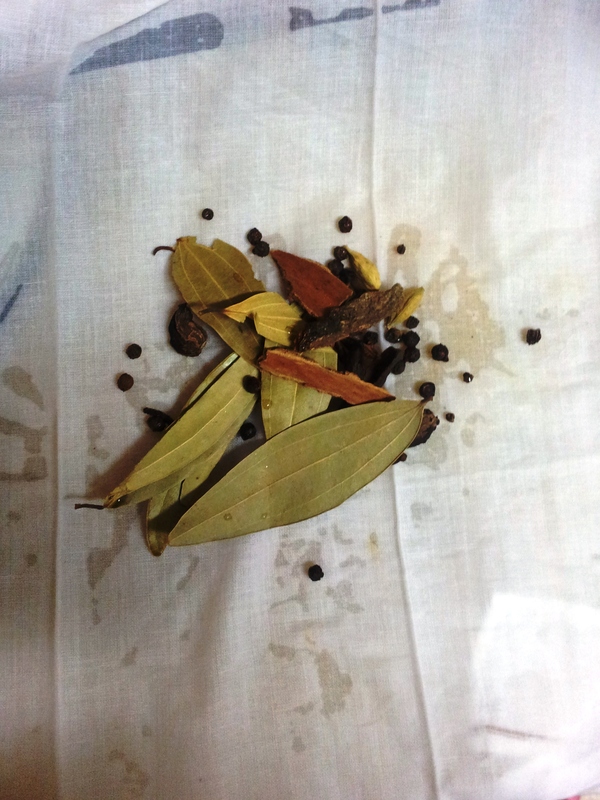 Take a muslin cloth, put all the whole spices mentioned above in the ingredients list. 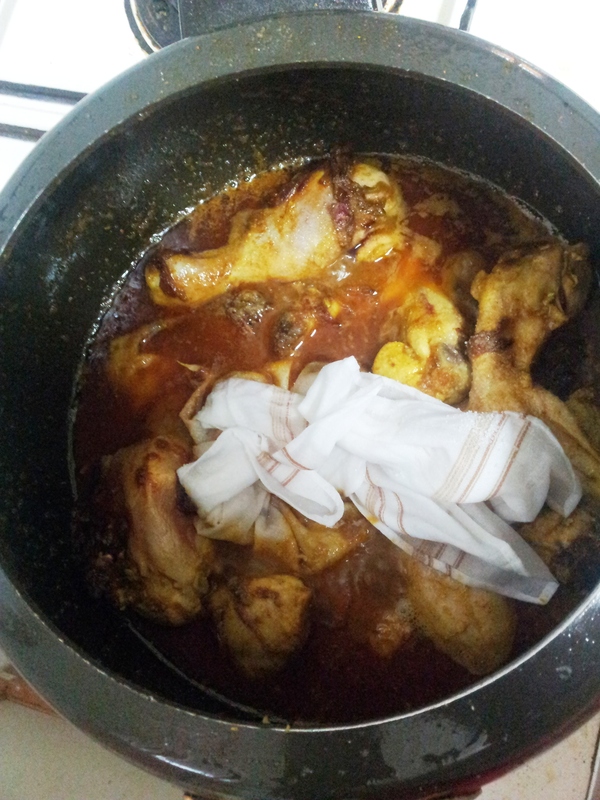 Now, tie the cloth and put it in the kashmiri chicken rogan josh. Cover the lid of the pressure cooker, give two whistles. Put off the gas and wait for 10 minutes. Open the lid, remove the muslin cloth; if too much water is there cook the chicken for some time on high flame to remove excess amount of water, otherwise no need to cook it again. Transfer the cooked Kashmiri chicken rogan josh in a serving bowl and garnish with fresh green coriander. 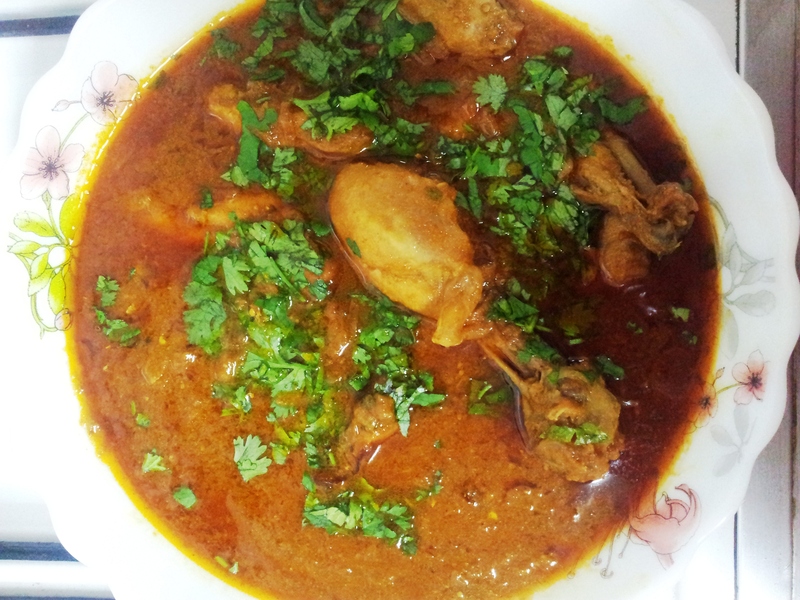 Served the yummy Kashmiri Chicken Rogan Josh hot with butter naan or zeera rice. Chicken Rogan Josh is Ready! To make your dish spicy and hot, you can add more kashmiri red chilli powder. If you are cooking in pot, time taken for cooking may exceed, whereas pressure cooker takes less time. its gr8 shumayala. We will surely have this. Thank you @apuginthekitchen 🙂 ..I’m glad you liked the recipe.